Mossad photographer Richard Gutjahr was pre-positioned in both Nice AND Munich! The photographer who was active in Nice, that you and Ole Dammegård spoke about, is on site at the Olympia event too. His band is Richard Gutjahr. He is posting on Twitter. On one of the RT pages appear one of his tweets. 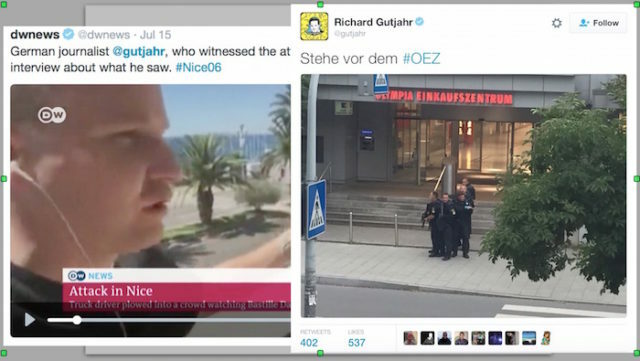 What are the odds that a guy with the background of Richard Gutjahr – married to a leading Israeli black operator – would “just happen to be there” to film the very beginning of the Nice truck attack AND today’s shooting at the Olympia Mall in Munich, Germany? Coincidence theorists will have a field day with this! And now he’s right in the middle of the shooting in Munich. Jim Dean is right, you can’t make this stuff up. Toga man and “Acropolis sign” point toward next attack in … Greece? Nope, the OLYMPIA Mall! As SK Bain explains at length, these guys have a WICKED sense of humor. And speaking of humor … we can’t let the bad guys monopolize it. If you can’t laugh at yourself, you have no business being in the conspiracy theory business. Looking back at my little spat with Ian Greenhalgh and Gordon Duff over the coup in Turkey – a topic we covered in the above False Flag Weekly News – it occurs to me that getting our egos heavily invested in our interpretations of such events is more than a little ridiculous. But since I didn’t say it before, I’ll say now that I actually do sympathize with Gordon and the VT management team’s animosity toward Erdogan’s war crimes in Syria. I may see a different big picture than they do, but I respect their hard work going after Erdogan for what I agree were criminal actions. But the main issue, as I’m sure Gordon and Ian will agree, is to stop the war in Syria and prevent more innocents from suffering and losing their lives and homes. I think the flopped coup, which is pushing Turkey out of the NATO orbit and into the waiting arms of Iran and Russia, is likely to help achieve that. What’s more, I hope and expect that US refusal to extradite CIA stooge Gulen will help the AKP and its allies turn Turkey into a truly independent democratic Islamic republic like Iran, just as Carter’s refusal to extradite the Shah helped consolidate the original democratic Islamic republic. And if Erdogan does consolidate power and avoids war crimes prosecutions…well, he is WAY down the list of war crimes perps as far as I am concerned. Let’s clean house here in the USA (starting with the Israelis/assets who own us and who did 9/11) and THEN move on to the smaller-time far-away crooks like Erdogan, whose apparent victory is not really about him, but about the Turkish people saving their decades-old movement toward Islam/democracy and independence from NATO-Zionist occupation. And whoever you think is right about this, thank God/Allah for VT and its tradition of free speech, hard-hitting debate, and uncommonly informative perspectives that you just won’t find anywhere else.